An official website launched and announced an original TV anime series. 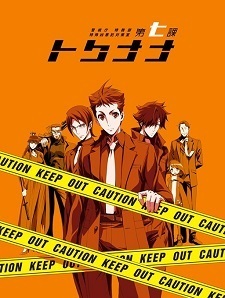 Titled Keishichou Tokumubu Tokushu Kyouakuhan Taisakushitsu Dainanaka: Tokunana (Special Crime Investigation Unit - Special 7), the anime is slated for this fall. Main staff and cast members have been revealed. To Keep Searching for What You Admire Straightforwardly. A long time ago dragons ruled a world of elves, dwarves, vampires, homunculi, and humans. In the present dragons have all but disappeared, so the ones left chose to live together, and their appearance came to resemble that humans. The year 2x19 in Tokyo is mostly a time of peace, but a group called the Nine cause chaos in their quest to obtain the dragons' powers and attempt to change the world. The police form a unit consisting of various experts to fight against Nine; the Special Crime Investigation Unit - Special 7 (Tokunana). These individuals have abilities that surpass the average human, to the extent that there are rumors of rebellion against them. A rookie, Seiji Nanatsuki, enters the unit. While teased by other members with colorful personalities, he sets out to solve cases involving Nine with his bright mind and straightforward thinking. Will he be able to find justice in the most grueling circumstances? The anime will have a stage at AnimeJapan 2019 on March 24. The three main cast members and chief director will be appearing for a talk show. Shimono Hiro and Tsuda together again as MCs like in ACCA omg. This is so exciting plus a megane elf voiced by Tatsun. Really hyped to see the great Chrono-sensei chara designing for anime. PV gives me Hakata Ramen vibes. Looks slick and stylish, like Cowboy Bebop combined with Blood Blockade Battlefront. The jazzy score is nice. A crisp police series would be welcome. Let's hope for some fun. This is giving me Kekkai Sensen vibes especially the characters and the premise. The PV looks really promising and has my attention already (only gripe was the main lead design). Can't say much about the staff working on this show but really hoping this will be a 2-cour show.. I love the vibe of this show! Probably Google translated from Japanese. No, I translated it myself before another news mod. kindly corrected it for me. which studio is making this anime ?